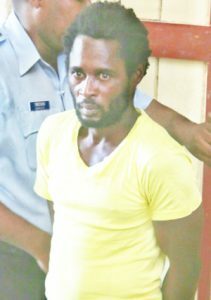 After allegedly chopping a man to the head with a cutlass, a 45-year-old miner was yesterday released on $75,000 bail, when he appeared before Chief Magistrate Ann McLennan on an attempted murder charge. The man, Collis Isaacs, of Blueberry Hill, Linden appeared in the Georgetown Magistrates’ Courts, where he was not required to plead to the indictable charge. Particulars of the charge alleged that on July 24, at Kumung Kumung Backdam, he wounded Troy Semple, with intent to murder him. Police Prosecutor Gordon Mansfield told the court that the men are known to each other. According to the prosecution, on the day in question, the men had a misunderstanding during which Semple left the scene and returned with a cutlass. Subsequently, a scuffle ensued and Isaacs took away the cutlass from Semple and dealt him a chop to the head. Semple is still hospitalized, but is in a stable condition. Attorney-at-Law Clyde Forde appeared on behalf of Isaacs. The lawyer requested for his client to be released on reasonable bail since the incident stemmed from a misunderstanding. Prosecutor Mansfield made no objections to bail. He, however, asked that same be granted in a substantial amount given the serious nature of the offence. In the end, bail was granted to Isaacs and he was ordered to lodge his passport with the Clerk of Courts and to report to the Bartica Police Station every Friday until the hearing and determination of the matter. The Chief Magistrate ordered the defendant to stay 50 feet away from the victim until the matter is determined. Isaacs is scheduled to make his next court appearance on August 16, when he will appear at the Bartica Magistrate’s Court.